Helen and Mike got married at Arrow Church in Alcester, and held their wedding reception at Deer Park Hall in Worcestershire. Deer Park Hall is one of my favourite wedding venues, largely due to the staggering variety of wedding photos you're able to take there. There's a large lawn, named 'Lambs Leap' that's a wonderful location for formal group photos, a beautiful garden for couples photos, and acres of countryside to get lost in. 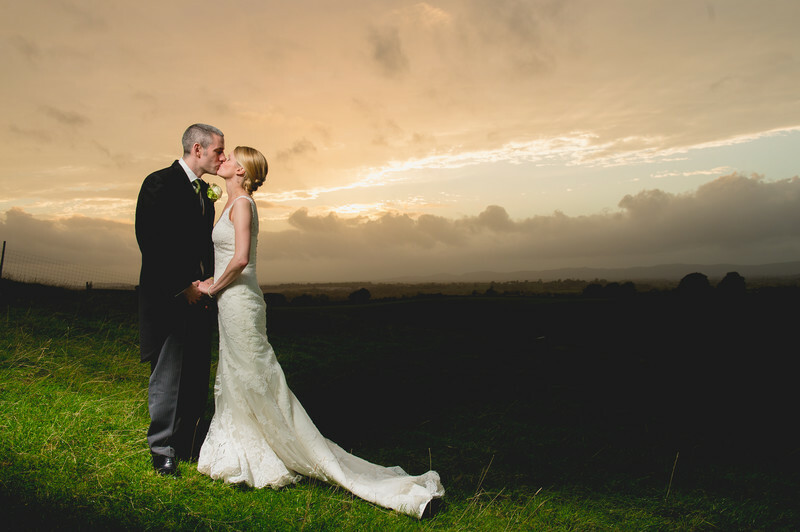 The rolling hills that surround the venue make for a perfect location for sunset wedding photography. The hills adjoining the venue slope steeply away from the lawn, and the elevated position means you can see unobstructed all the way to the Malvern Hills, 19km away. For this photo of Helen and Mike, I pulled them away from their wedding reception for 10 minutes in order to grab this photo - in late summer you get stunning sunsets over the Hills but the light fades rapidly, and you can miss an opportunity in the space of 5 minutes. I could see this incredible sunset forming, and knew that we wouldn't have much time to nail the picture. I grabbed my camera and a single lens, along with my light stand, flashgun and soft box. As soon as we got into the desired location I wasted no time in getting shots in the bag. Without the use of the off-camera light (known as strobist wedding photography) the bride and groom would have been a silhouette. I don't use this form of lighting too often as it can be intrusive and overpowering, but for shots like these, there's no other way around it. I am recommended wedding photographer for Deer Park Hall as I have been for the last 6 years.